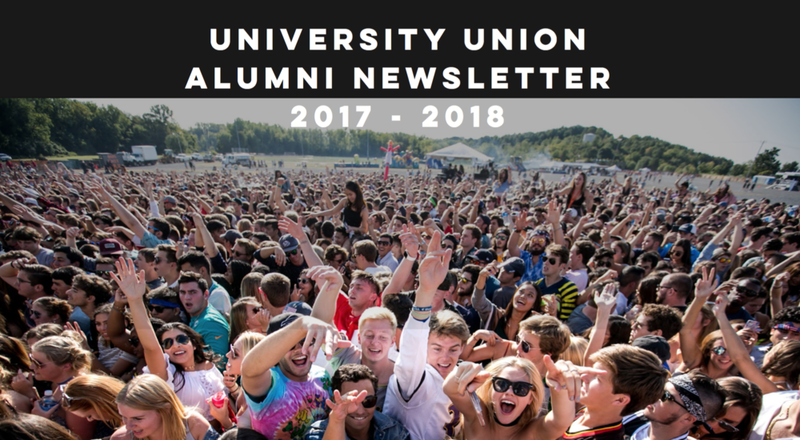 To keep our alumni up to date, we send out an alumni newsletter annually! This recaps all University Union events for the past academic school year. Check out the 2017-2018 Alumni Newsletter HERE! During Orange Central Weekend 2017, University Union held our first Alumni Event to celebrate 55 years as an organization! Current and past University Union members enjoyed a dinner in Panasci lounge with heartwarming speeches from UU alumni Chrysann Panos, Erin Singleton and former UU President, Jonah Rappaport. To conclude the night, the alumni toured the current UU office space and attended a show featuring T.J. Miller and the Lucas Brothers brought to SU by University Union and the Traditions Committee. Check out some pictures below! Please email uupublicrelations@gmail.com for any alumni inquiries.